Carolyn Bessette was the epitome of a style icon. There has been no actress or model that has come close to her fashion sense- there has only been copycats. 15 years after her untimely death, Carolyn, in my opinion was the ‘it’ girl when it comes to fashion. Famous for her who she married; Carolyn was known for much more- her minimalism. Mrs. John F. Kennedy Jr., like her mother-in-law, were reluctant fashion icons. Adored by millions, their outfits were photographed more than the current starlets of their times. As I looked back on images of Carolyn over the years I was astounded how every outfit would fit right into today’s current fashion scene….she was way ahead of her times! Carolyn had street style nailed. The picture below could easily be seen on the streets today. The bag alone looks like something Celine would carry. Carolyn’s street style was effortless. 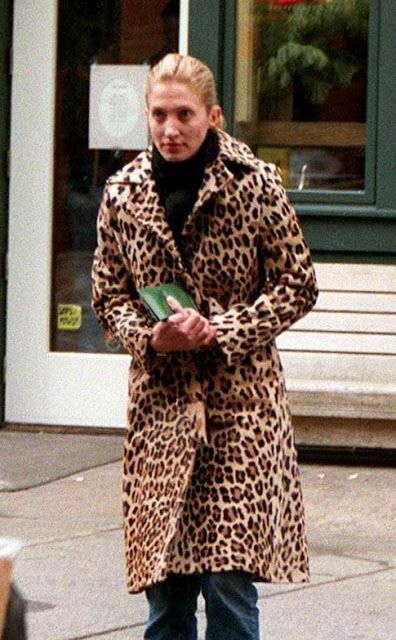 Animal print has been the rave for years. Carolyn, again, was way ahead of her times. Sporting leopard is something you now see every season. Baseball caps worn backwards are mostly seen on rappers or hip hop types, but Carolyn took the cap and made it ultra chic. I am totes copying! The jean is now an acceptable pant to be worn on most occasions. Did Carolyn know this little secret? I was surprised to see the ‘cropped jean’ pictured here, which is still relevant today. I wonder if Carolyn would have adopted to the skinny jean? I know she would have looked amaze! Carolyn knew her best accessory was her dog…mine too! Perhaps one of the most iconic photos is her wedding picture. Minimalism done right on every front. Probably the most perfect bride I have ever seen. Less is more squirrels! Carolyn Bessette was a classic beauty. A true minimalist in every part of her life. From Carolyn’s perfect red lip, to her simple bun, Ms. Bessette will always be my fashion ‘It’ girl! Audrey Hepburn comes a close second! This post is so right on! I agree she was way ahead of her time. Walking the dog or going to going to a gala she was always put together. Effortlessly chic that was Carolyn!